How did you sleep last night? For millions of people, the answer falls somewhere between “okay” and “terribly.” It seems that more and more of us are getting worse and worse sleep, and the consequences can be devastating. It’s important to get good sleep, but it can be difficult to do so. Here are some tips for sleeping better—naturally. Saying that sleep is important is an understatement. You’ve almost certainly noticed the difference in how you feel when you’ve slept well and how you feel when you’ve hardly slept at all. Poor sleep can ruin your entire day, from the moment you struggle to get out of bed in the morning until you finally collapse into bed again at night. That’s because sleep affects us in so many ways—physically, mentally, and emotionally. Our quality of sleep is linked to our eating habits and weight gain. Bad sleep puts us at higher risk for certain diseases, whereas good sleep helps us concentrate and perform well. Getting quality sleep improves our emotional health and helps us work better with others. Unfortunately, many of us aren’t getting the sleep we need. Studies show that more than one-third of Americans don’t sleep enough. In many cases, this sleep deprivation occurs because people don’t prioritize sleep. Many others, however, struggle with insomnia. Research suggests that 10% of adults have chronic insomnia, and approximately one-third of adults experience at least occasional symptoms of insomnia. Of course, you don’t have to have insomnia to want to sleep better. Many people want to fall asleep faster, toss and turn less, and feel better rested in the morning. Most of us can benefit from improving our sleep. If you thought sleeping pills were the only option, then think again. 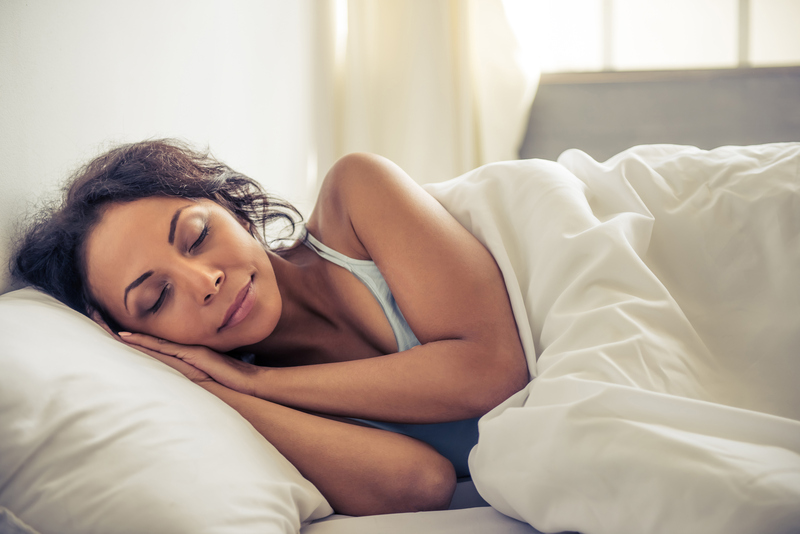 There are plenty of natural ways you can improve your sleep, but here are four of the most helpful. These solutions range in effort and expense, so find what will work best for you and your lifestyle. 1. Avoid electronic devices at bedtime. The first iPhone launched 10 years ago, and the world has never been the same. Many people keep their smartphones within arm’s reach day and night, using their phone just after waking and just before sleep. Though these devices offer many benefits, they also damage your sleep. That’s because cell phones (and tablets, computers, and even televisions) emit blue light, which keeps your brain from producing melatonin properly. Less melatonin means worse sleep. So what do you do? Ultimately, as Harvard University neuroscientist Anne-Marie Chang says, “the best and least popular answer would be to simply avoid your devices before going to sleep!” Keep televisions and computers out of the bedroom, and try to unplug from all your devices a couple hours before bed to maximize your melatonin and your sleep. Some are unable to refrain—the temptation is just too great. Because of this, many parents are canceling their cable in favor of streaming apps that they can control. Shutting off usage starting at 9:00 PM, for example, prohibits teens (and their parents) from using devices right before bed. If you must use devices right before bed (working late?) then consider using blue-light blocking glasses that are newly on the market. While you might not think about it much, your mattress has a big effect on your life. A good mattress helps you sleep, but a bad mattress can have a number of negative effects. It can worsen your allergies, hurt your back, make you snore, and ruin your sleep. If you haven’t replaced your mattress in a while, you might be surprised at how much it improves your sleep. Look for a mattress that’s comfortable while still providing plenty of support. If you’re not ready to invest in a new bed, Sarah Brown, health and wellness expert for Mattress Firm, suggests a memory foam topper: “A mattress topper is often a fraction of the price of a new mattress, but it can dramatically change the feel of your current mattress.” This may not work on a sagging old mattress, however. Says Brown, “A topper can increase comfort, but it won’t add much support.” If you need support, it’s best to invest in your sleep with a new mattress. Some foods have been shown to improve sleep. Cherries, for example, are a natural source of melatonin. Fish contains the sedative tryptophan, making tuna another good choice to promote better rest. Then there’s bananas, which are full of the muscle-relaxing minerals potassium and magnesium. You can also eat calcium-rich foods like spinach, almonds, and milk, as calcium helps produce melatonin. Such a variety means there’s a sleep-promoting food for every palate. That doesn’t mean, however, that all foods are good for sleep. Several foods have been shown to worsen sleep. There are the obvious offenders, like caffeine-heavy coffee or chocolate. But did you know that spicy foods also make it harder to fall asleep and stay asleep? High-fat foods are another culprit that have been linked to nighttime wakefulness. For optimal sleep, cut these foods from your diet, or at least avoid them in the hours before bedtime. 4. Try some essential oils. Essential oils are a simple, low-prep way you can promote better sleep. There are many different oils you can try. Lavender, unsurprisingly, is one of the most-recommended options. Plenty of research and personal anecdotes testify to its sleep-promoting benefits, making it a good choice for anyone beginning to experiment with essential oils. Other recommended oils include vetiver, chamomile, and ylang ylang. You can use whatever oil you decide on either topically or aromatically. Be sure to dilute the oil if you apply it to your skin, or just use a diffuser in your bedroom to enjoy aromatic benefits. Either method should help you relax and get to sleep. For a healthy and happy life, you need to make quality sleep a priority. Fortunately, these suggestions make it easy to get that better sleep you want. You can begin by experimenting with just one tip, or you can incorporate them all. Decide what works best for you, then start tonight—and get ready for a great night’s sleep! Hilary is a health and wellness consultant and journalist based in Utah. Her years of expertise in the field have led her to write for websites like Today, PurposeFairy, KSL News, and SafeWise, and she's been quoted for her expertise in publications like Reader's Digest, The Bump, and Best Life. A former insomniac, she specializes in senior health, family health and sleep disorders.